(CNN) -- Two Americans and an Israeli were awarded the Nobel Prize in chemistry on Wednesday for painstakingly mapping out the thousands of atoms that make up the ribosome -- work that paves the way for new antibiotics. U.S. researcher Thomas Steitz is one of three scientists sharing the 2009 Nobel Prize in chemistry. Inside all animals, plants and bacteria are DNA molecules that contain the blueprint for life. Ribosomes are an organism's protein factories. They use the information in the DNA to make the tens of thousands of proteins that enable the organism to function properly. These proteins include hormones, enzymes and hemoglobin, which transports oxygen. From a medicinal standpoint, the ribosome is important because it is what antibiotics target. In a bacterial strain, antibiotics bind to the ribosomes, preventing them from making the proteins the bacteria need to survive. Americans Venkatraman Ramakrishnan and Thomas Steitz and Israeli Ada Yonath shared the $1.4 million prize for mapping the position of the thousands and thousands of atoms that make up ribosomes. Their three-dimensional models showed how different antibiotics bind to the ribosome. "These models are now used by scientists in order to develop new antibiotics, directly assisting the saving of lives and decreasing humanity's suffering," said the Royal Swedish Academy of Sciences, which awards the prize. Ramakrishnan, a U.S. citizen who was born in India, is a senior scientist and group leader at MRC Laboratory of Molecular Biology in Cambridge, England, according to the Nobel Prize Web site. 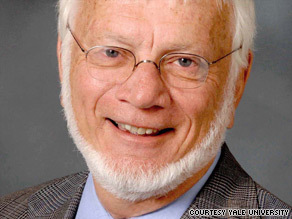 Steitz is a professor at Yale University and an investigator at Howard Hughes Medical Institute at Yale, the site said. Yonath is a professor at the Weizmann Institute of Science in Rehovot, Israel, and director of the Helen & Milton A. Kimmelman Center for Biomolecular Structure & Assembly at the Weizmann Institute, the Nobel site said. The Nobel Prizes are being awarded this week and next. The medicine award was handed out on Monday and the one for physics on Tuesday. The prize for literature will be awarded Thursday; the Nobel Peace Prize winner will be named on Friday, and the award in economics will be issued on Monday.